This is how Flappy Bird‘s time in the public eye should’ve occurred: it should’ve been just another lo-fi, challenging mobile game with an immediate and obsessive, albeit niche, following. People would download it, having seen other iOS players mention it on Twitter. Personal high scores would be tweeted back and forth in unofficial challenges. Game Center Leaderboards would be refreshed as everyone tries to beat out their friends. A few people would tweet, just once, how they don’t ‘get it’ and how they are slightly baffled by its success. Just once. Then they would move on and talk about something else. A week later, Flappy Bird would disappear. Just another firework of the App Store, disappearing as fast as it lit up the sky. That’s not what happened. Instead of shrugging at it and moving on, those that disliked Flappy Bird wanted it crucified – it is everything that is wrong with mobile gaming. It has advertisements. Its pipes look like the pipes of the Blessed Child Mario. It’s simple and compelling. It has mainstream appeal. 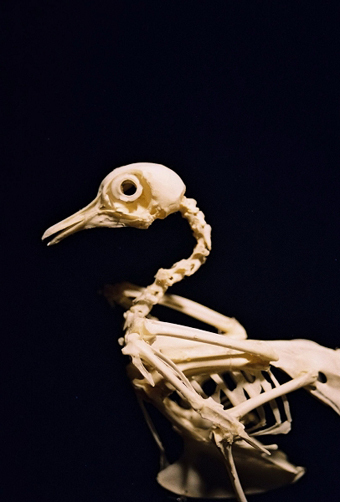 It has a bird in it. 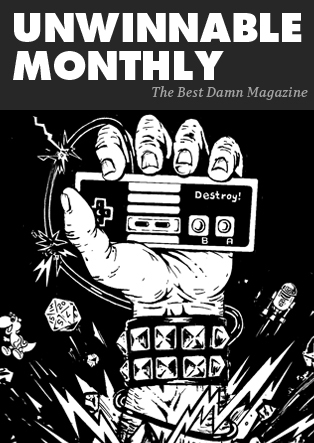 For some, it is a pastiche of everything that is wrong and toxic about mobile games. Schreier’s Twitter apology is even worse, caveating that he hopes that one day someone brings to light the “full story” of the game’s creation. It’s a myth that games culture perpetuates and the games journalism industry depends on: there’s always a story; there’s always something sly happening just out of sight that we must uncover; something is going on here, and by George we will figure it out even if we have to refresh this NeoGAF thread all night. I have not spoken to Nguyen about Flappy Bird at all, but I’d feel pretty safe betting the ‘full story’ goes a little something like this: a guy makes a whole bunch of little games, using derivative and simple art to help him quickly prototype and implement these ideas. Using the wonders of digital distribution, he throws these little, prototype-y games on the App Store because, why not? There’s no shortage of developers that do this, and the App Store is full of delightful little trashy games. One of those games was really good; the people that played it told others to play it; a few websites wrote stories about it telling people to play it; the dude is overwhelmed when he makes a whole bunch of money off the little ads he put in the game. That’s probably it. No sneaky, malicious conspiracy to steal everyone’s money or undermine the game system. Just a person – one person – who makes games having some success. But online games culture can’t stand this. We can’t stand a game that doesn’t do something innovative being so successful, so popular, so profitable. How dare it? This offense felt by people unaffected by the game’s existence infuriates me. It infuriates me because I love trashy games and I want more creators to just throw their half-baked ideas out there with confidence, and this saga tells them they shouldn’t do that. It infuriates me because people are so quick to call ‘clone’ when something either looks like something else (but doesn’t play like it) or plays like something else (but doesn’t look like it) instead of appreciating the whole game on its own terms. It infuriates me, most of all, because its very popularity demands it be understood, critiqued and appreciated on its own terms – not just dismissed outright as a bad game – which it isn’t. So let’s look beyond those green pipes and attempt to understand what makes Flappy Bird so compelling (something game critics had no trouble doing in a myriad of articles about Braid). 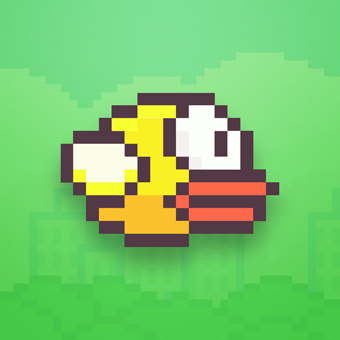 First things first: Flappy Bird is not about flying; it is about flapping. Like Tiny Wings’s protagonist, our bird’s body is too big for her wings. But unlike Tiny Wings‘s bird, who finds a heartwarming solution to her predicament, gliding gracefully across hills and clouds, the Flappy Bird flaps frantically, never getting anywhere. The moment she stops, she plummets face-first into the ground, arse in the air. There’s a slapstick, black humor to it – a morbid desperation. Mechanically, this translates into the game’s difficulty. In most flying games, it’s possible to find an equilibrium as your flaps turn into something resembling gliding. Not here. Flap too little and you plummet; flap too much and you’ll bang your head on the pipe. You must compensate for overcompensation. 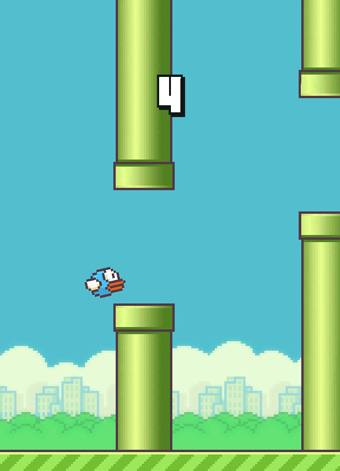 The greatest moment in Flappy Bird is that fall from a tall pipe down to a low one. Jason Killingsworth tweeted the best analogy for this moment, noting how you feel like James Bond in Goldeneye leaping off a cliff and into a falling plane. Flappy Bird, then, is a game about falling. It’s a game about self-constraint. The moments you tap the screen to spring upwards are secondary to all the moments you force yourself to not tap the screen, the moments you hold off. You can’t just tap once between two pipes to slow your fall and make the next pipe that bit easier; that will throw you off course. You need to plummet at full speed, holding off, then tapping at exactly the right moment to get through the next pipe. Then you have to trust yourself, trust that that tap will get you through the next pipe. Second-guess yourself, and your instinctive, defensive tap will smash you into the ceiling. Some have talked about how entrancing they find Flappy Bird. This is because if you think, you will kill yourself. Flappy Bird is the distillation of the second button press of a platformer’s double-jump, that mid-air propelling off nothing to maneuver around some obstacle. You are doing the second jump of a double-jump again and again and again. These are some of the particular things that have made Flappy Bird so compelling to so many, and an appreciation of them is lost every time a critic dismisses the game outright for being too ‘derivative’, for not being ‘innovative’ enough. I hate the notion of ‘innovation’ as some Holy Grail of game design. I don’t know when or where it entered the vocabularies of tech and games cultures, but I suspect it was smuggled in as a marketing buzzword through Californian start-ups, and now we are stuck with it. I hate this notion that the most important thing a new game should do is ‘innovate,’ that it should do something completely new. Of course, there are plenty of great innovative games that are great because they innovated: Half-Life, Minecraft, Tetris, Super Mario Bros., and no shortage of others. And, of course, there is no shortage of terrible games that do nothing but reproduce a Frankensteinian corpse of previously successful games, stitching together limbs in the hope of stealing the same success. But between the two extremes there are huge swathes of games that don’t innovate so much as they iterate, great games that don’t turn the industry on its head but which take an idea that’s been done before and do something new with it, or give it a polish or focus that no previous game has. Like films or books or songs within the same genre, there is no shortage of games that are great games because they do something that has already been done. This is no less true of indie games than it is for AAA blockbusters or mobile games. But games culture often struggles to appreciate those games. Innovation is held up as this be-all and end-all achievement, the only thing creators should be striving for. I think one of the main reasons Flappy Bird has drawn so much bile is that it is so earnestly and transparently not trying to be innovative, and we have been conditioned to think only innovative games deserve success. Of course, that is rubbish. It’s a lowbrow/highbrow false divide not dissimilar to the one that tries to privilege ‘literature’ over genre fiction. Innovation is only important if a game is trying to be innovative. I am far more interested in how well a game does what it is trying to do: how aesthetically consistent it is, how focused it is. If a game executes an idea well, I couldn’t care less how many previous games executed the same or a similar idea. Flappy Bird realizes what it set out to accomplish. It is not the greatest game ever made, and it should go without saying that you don’t have to like it. But it is a good game, and its popularity is a testament to its quality. It’s solid, and the people who enjoy it have no shortage of valid reasons for enjoying it. Maybe this small game made by one person in three days borrowed its style from a multi-million unit-selling corporation’s intellectual property; who cares? It should be a wonderful success story that exemplifies why amateur developers should have the confidence to put their messy, trashy little games out there for the world to play. Instead, it just brings to light the narrow-sightedness and narrow-mindedness that lead some sections of games culture to bash every game with that one measuring stick of ‘Innovation’ instead of bothering to understand why people are enjoying the game in the first place.